The 'Norse Encampment' is the collective name given to a series of living history programs, which illustrate daily life in the Viking Age. Historic interpreters, employing replica objects, bring the past to life through typical activities of the Norse, and portraying historic styled characters. Throughout the series exceptional care was taken to ensure everything involved in a presentation was reflective of current archaeological research. One cornerstone of all the presentations was reference to the Vinland voyages by the Norse, circa 1000 AD. The impact of the Norse Encampment owes a great deal to the collection of detailed reproductions that surround the interpretive staff. Producing detailed copies of early period artifacts involves both research and craftsmanship. This segment details the approaches and problems of the process. Of special interest to re-enactors of the Viking Age is a series of production drawings used in the creation of the artifact reproductions for the Norse Encampment. This is a draft version of an ongoing research project to gather together artifact evidence from a number of sources into an overview of knives from the Viking Age. Although not a finished report, it may prove interesting to re-enactors and bladesmiths. One of the many objects created for the 2010 presentation by DARC was an Icelandic pattern Warp Weighted Loom. This short article contains plans, photos and a video clip detailing the work undertaken to take raw logs and work them to the finished object. A basic overview of this technique. Some reference to artifact prototypes, but this is primarily a guide for home artisans. Why an object might survive into our modern age is reliant on a number of often quite random factors. Accidents of preservation may result in a quite odd reflection of the past. This commentary suggests that objects alone may not always be quite what they seem. The series listed here are demonstrations of physical techniques, primarily related to the production of various replica and reproduction objects used in the program. A wide range of historically accurate Viking Age cookware and tools were produced for the 2008 film OUTLANDER. This is a commentary on the work undertaken, and the process of coverting artifacts to working replicas. The Wareham Forge was started because of an interest in creating working replicas of Viking Age objects. Over the years, a large number of detailed replicas have been produced for both museum exhibits and living history programs. This has included objects for serious re-enactors - even feature films. This gallery style overview features a number of these replicas with commentaries on historic sources, technical methods and general observations. In the selection and creation of the replicas used the Norse Encampment, it was necessary to base the objects on a number of historic sources. Most of the larger pieces are based on the grave goods found in the Oseberg ship from Norway. This burial dates to the early 800's and consists of a rich selection of funerary items including a complete 'camping' outfit, with tent, collapsible beds, and cook set. Many of the smaller items are based on the profusion of everyday artifacts found at Coppergate in York, England, and Woods Quay in Dublin, Ireland. Both of these are town sites, and date to the late 900's. The selection of tools is based on those found at Mastermyr in Gotland, which have been dated to circa 1150 AD. The bronze ring pins and soapstone spindle whorls are based on those actually recovered at L' Anse aux Meadows. Each replica * is as close as possible to the original artifact type. Many have been created using the same techniques that were used by the Norse craftsmen 1000 years ago, with extensive use of period type tools and hand forming techniques. In some cases the raw materials utilised are modern substitutions because of availability, cost, time constraints or safety concerns. Modern production techniques have been used as well, where these methods do not detract from the overall appearance of the object, or were they contribute significantly to the durability of the item. Each of the materials / technique classes will be discussed, to explain the rational of the balance between historical and modern elements. Those interested in the 'Art of the Possible' as it effects the process of designing and creating an interpretive program like the Viking Encampment will also find the paper 'Lessons from the Viking Age' (in the Research section) of interest. Generally, extensive use of hand techniques and traditional equipment makes the appearance of the forged replicas extremely close to the original artifacts. There are two important factors effecting the quality of the 'iron' objects. Most important is the substitution, in almost all cases, of modern steels for what would have been originally been wrought iron. 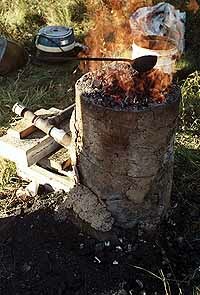 The Norse would have created metallic bars from 'bog iron' ore using simple bowl furnaces firing charcoal. In simple terms, wrought iron is a form of ferris metal that is made up of essentially pure iron. Its production entails repeated hammering to squeeze out glassy slag - hence the name 'wrought' iron. Small amounts of this slag remain in microscopic layers, and both this, and the purity of the iron, greatly reduce the speed of oxidation (rusting). Steel, on the other hand, is an alloy formed by combining small amounts of carbon with the iron, usually by controlling the nature of the fire during the smelting fire. As a material steel is both tougher and more resistant to bending. Wrought iron, as opposed to the mild steel universal today, was the primary raw material for the blacksmith until the middle of the 1800's. About 1850, the invention of the Bessemer furnace allowed cheap production of steel under controlled conditions. This combined with the increasing use of machinery, which required the qualities that steel possessed for parts. By about 1870 steel had replaced wrought iron as the primary material for the blacksmith. By the early 1900's wrought iron was no longer produced in industrial quantities in North America. The last commercial wrought iron mills in Europe were shut down in the 1970's, and outside of museums, this specific material is not produced anywhere in the Western world. Wrought iron has a fibrous texture that often effects the way a desired shape must be formed. It is easier to weld in the forge than mild steel, and it also works in a significantly different temperature range. The fact that any long rods would have to be drawn out and sheet would have to be hammered from bar by hand adds to the character of original artifacts as well. Although small amounts of antique wrought iron are still sometimes available as scrap, essentially all modern forge work is done with commercial mild steel bars. Those few replicas for the Encampment that contain wrought iron are made of bars salvaged from a bridge originally constructed in the 1850's. Today, mild steel comes in a wide range of shapes and sizes, mostly in identical twenty foot lengths, while sheets of uniform thickness come measuring four by eight feet. A huge range of tool containing a wide range of additional elements as alloys and various carbon contents are available. So complex are modern alloys that it often is difficult to purchase the simple carbon steels which most closely resemble period types. The second factor which effects the appearance of the objects is the subtle effect of working in a modern shop. Norse smiths would have used bowl shaped forges firing charcoal, extremely small anvils and only the most basic of tools. All the replicas were produced in a shop that combined both traditional (circa 1850) and contemporary machine tools. The forge used as a heat source was coal fired with an electric blower. The effect of this change from the Viking Age pit forge is quite subtle. A norse charcoal forge typically heats metal in four inches sections. In the coal fire, with its higher operating temperatures, the heated area is over six inches. It is easy to bring twelve inches up to proper forging heat. For most replicas, this effect is invisible. Care had to be taken to reduce the heated area when long twists were being made, as are used on the Oseberg tripod. Careful examination of the original artifact clearly shows the twists being laid down in a series of four inch sections. The anvil used was also a traditional tool, in this case from about 1860. Norse anvils have extremely small work surfaces and very simple horns, if any at all. Normal practice is to use the horn for such processes as drawing out bars and for forming curves. 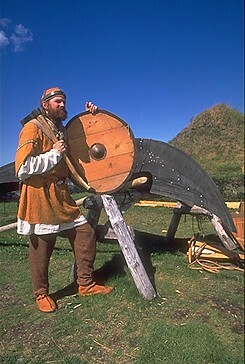 In making the replicas, use of the horn was avoided as much as possible to better replicate the forms possible to a Norse smith. The ancient smith would also not have vices available to him. Any clamping that would be required would have to be done using wooden clamps similar to those used in ship building. Such shapes as twists would be formed by employing two men with tongs, one holding and the other turning the bar. In this case, a traditional post vice was used, as the workshop is not equipped with an apprentice! All welding on the replicas was accomplished by the use of hammer welding in the fire (sometimes called 'blacksmith's welds'). This technique is significantly more difficult that use of modern torch or arc welds. Hammer welds were deemed crucial, as they have a very different appearance than the 20th century techniques. The only objects ground and polished were the cutting edges. In the interest of reducing time, all rough grinding was done on an electric bench grinder finer work with a belt sander. The final finish was done on a antique sandstone grindstone. Although this stone had been fit with an electric drive motor, it is essentially no different from the hand cranked stones available to the Norse bladesmith. Any holes need were hot punched rather than drilled. Hot punching deforms the metal, resulting in a obvious change in the overall contour. This effect is most obvious on objects such as the ring trammel. In order to better replicate the effect of the originals, the contours of the commercially available steel bars were hand hammered to new sizes. The process basically required that all the material had to be hand hammered to rough bars first - before the forming of individual objects even began. Creation of such objects as the cauldron hanger required many feet of re-sized bar. To conserve both time and effort, commercial mild steel sheet was used for those items that required it (rather than attempting to hand hammer sheet from bar!). Objects such as the shield boss were worked using a combination of hot and cold forming techniques to better conceal the modern material. Tools and cutting edges were created using a number of different materials and techniques. The majority of the tools are forged of solid carbon steel bars which was then suitably heat treated. In general, the carbon content of the replicas is higher than that in the originals, a substitution made primarily to increase durability. Axes are made with inset steel edges, with mild steel bodies wrapped around a core wedge of carbon steel, then hammer welded together. Two objects use the technique of pattern welding (one knife and spear). Here a bundle of various metals are forge welded to a block, matching blocks are twisted and then forged together. The resulting material is then forged to the shape of the final item. 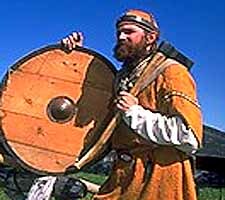 Some use of both copper and bronze (an alloy of copper and tin) in sheet form was made in the Viking Age. The most typical use for these materials were for containers such as boxes, buckets and most importantly, cauldrons. In ancient times, sheet would have be laboriously hammered out from bar by hand. For the replicas utilising these materials for the Encampment, standard industrial sheet was used. The largest difference between the two methods is that modern process forms material that is totally consistent in thickness and content, period metal sheet would have had variations. It also proved impossible to secure bronze in thin sheets. Brass (an alloy of copper and zinc) has been substituted instead. In the case of the cooking pot, there is no significant difference in appearance caused by this substitution. As was the method on the originals, the copper and bronze used is secured by riveting and/or soldering (all solders are lead free). Some use of this material was made during the Viking Age, mainly in the form of lower cost jewellery items. Pewter is an alloy of lead and tin, the concentrations of the two metals varies considerably both through time and geography. Generally the higher concentrations occur in areas where tin can be locally mined, such areas had reputations for quality that hold to the modern day (Cornwall, England for example). The higher the tin content, the more rigid the object, and the longer it's surfaces will stay polished. The variation in content of historic pewter is so extreme that archaeologists refer to these materials as 'lead alloy' in modern descriptions. It is important to note that in the Viking Age, people would have wanted pewter to remain shiny (not dull , as is the modern taste). The reason for this is that 'fresh out of the mould', a high tin content pewter looks very much like silver in appearance, but at a fraction of the price! All the pewter mounts and pendants used in the Encampment are made of a modern 'lead free pewter', which in fact is an alloy composed of some 92% tin. They all have been cast in hand cut soapstone moulds, a process used for mass production of similar objects by the Norse. One of the largest problems in the recreation of historic artifacts is that surrounding the securing of suitable timber. In truth the Viking Age was an age of wood, timber would have been the most common material used for all purposes. Almost without exception, modern timbers are saw cut, either with huge band or circular saws. In either case, the distinctive blade marks had to be removed. More importantly, this use of modern saws enables the lumber producer to cut slabs from logs regardless of grain direction or existence of knots. Another major obstacle was finding the duplicate types of woods, in the required widths and thickness. Without resorting to having timber custom cut, this proved extremely difficult. (Time, cost and the small quantities needed made custom cutting impossible.) Two particular problems were the 1 x 10" beech for the bed and the 2 x 10" oak slab for the tool box. The wide ash boards needed for making shields proved totally unavailable. The end result was that the wood used in the replicas only approximates the appearance of that used on the original artifacts. The beech, seen on the beds, has too distorted a grain to have ever been produced with anything but modern machinery. It also has been steamed, a modern practice that changes the colour slightly to bring up the pattern in the grain. The end posts of the bed are made of bass wood, beach (or even maple) was not available in the required 4 x 4" size. The oak used for the sea chest and tool box is of a different variety than the original, with American red oak being substituted for English oak. Elm is used for one of the shields and one of the sea chests. These particular planks were likely cut in the late 1960's, before Dutch elm disease devastated the elm population of Southern Ontario. In the interests of time (and required skill!) much of the wood working has been done with power tools. Care has been taken to redress the surfaces where possible to emulate hand worked surfaces. All the tool handles have been split from maple timber, then shaped with a draw knife. As has been mentioned elsewhere, hard evidence for textile artifacts is extremely limited. Only a mere handful of fabric scraps of survived, with only a couple of complete garments. Wool would have been the major fibre type. Linen was available as an import to Scandinavia, especially from the Norse / Irish settlements such as Dublin. Both cotton and silk could be purchased as exotic imports, it must be assumed that these fabrics would have been extremely expensive. Surviving samples suggest that extremely fine threads often made up cloth, but again intensive labour suggests limited production and thus high costs. Likely the average person had clothing made of fairly rough cloth. Woolen cloth of standardised width and quality, called wadmal, was a common trade good for the Norse. Colours for clothing are somewhat speculative. Surviving fragments give some indications, as do such things as deposits containing pollen grains, which tell us what dye plants likely were used. Generally it should be assumed that the muted colours of the natural fleece and wild dye stuff would be most common. Bright colours would be desirable and sought after, but the kind of intense chemical colours familiar to the modern audience would not be possible. Evidence for the actual cut of the clothing again must come from more secondary sources due to the lack of surviving garments. Depictions of the human figure occur in Norse art, but are often heavily stylised. For this reason, only the broad outlines of period dress are known, the fine details are somewhat speculative. In creating the clothing for the Encampment, an attempt was made to create the right feel for the period, rather than to duplicate specific artifact evidence. The fabrics are all modern commercial textiles, chosen to emulate period types. Fibre contents vary, many are blends of wool / cotton or linen / cotton, used for their durability. Machine stitching was used for the bulk of the construction, with hand work only on visible seams. It must be remembered that the realities of modern hygiene, simple maintenance and materials costs all had a major impact on the construction of the costuming. * Here the term 'replica' is used to refer to an 'object made as if it was new'. This is to avoid confusion with 'reproduction' which would refer to an 'object that duplicates the aged appearance of an ancient artifact'. The majority of the some 175 individual replica objects that equipped the original 'Viking Encampment' at L' Anse aux Meadows NHS were created by Darrell Markewitz of the Wareham Forge. The collection also includes work by a number of other artisans, listed below. Special note should be made of the costumes, designed and created by Vandy Simpson. Lole' Thompson also assisted on the overall project as an student intern. It should also be noted that the Interpretive Staff of the Viking Encampment have added a number of small items to the display, created as part of the ongoing daily demonstrations.